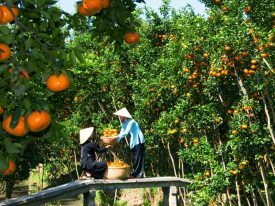 » WHAT SHOULD WE BUY IN CHAU DOC, AN GIANG? Chau Doc fish sauce! Chau Doc dried fish! This place is almost tied with specialties from fish sauce and dried fish. Why is this land famous for its specialties? And can you buy other specialties when you come here? It is not difficult to find a souvenir as a gift in Chau Doc. 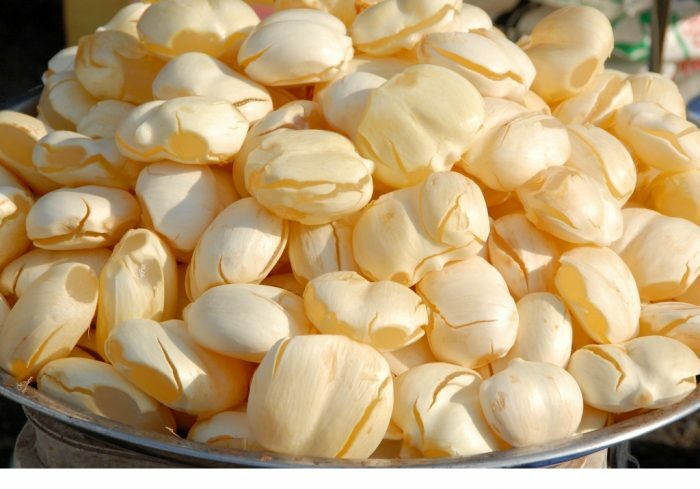 In addition to the featured products such as fish sauce, dried fish. When coming here, visitors can buy specialties made from wine palm, elaeocarpusor or ricinus salad .. Just walk around Chau Doc market or cool off the road in the afternoon, visitors can easily pick the gift here in a short time. 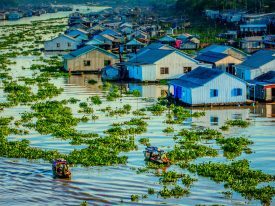 Chau Doc is known as the “salted fish kingdom” because it is located in the confluence of the Hau River, one of the two tributaries of the Mekong River known for its abundant fish stocks. Visitors will find attractive types of fish sauce made from henicorhynchus fish, snakehead fish, sesarma mederi… The most famous one is the Thai salted fish sold everywhere. Chau Doc salted fish has a slightly sweet taste of the Southwest, but salty inside, very suitable to eat with white rice, especially on rainy days. 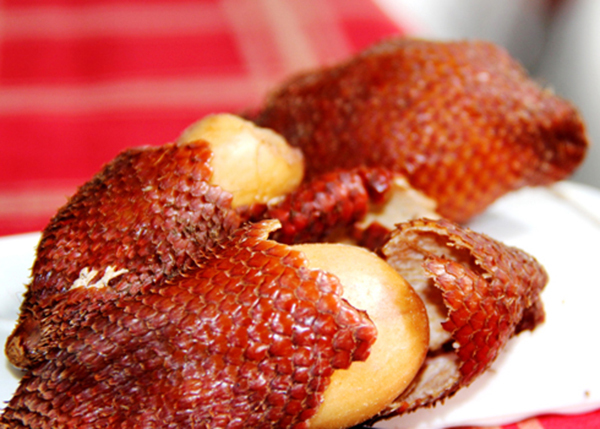 Many famous brand names in Chau Doc do follow the formulas of hereditary so their tastes are different. Visitors can ask the seller in Chau Doc Market or at the foot of Sam mountain to help choose the best kind of sauce as gifts. Besides fish sauce, dried fish is also famous in Chau Doc. Due to the high amount of fresh fishes, there are many kinds of dried fishes such as: henicorhynchus, snakehead, sesarma mederi … Chau Doc also has delicious dried beef, divided into 3 types including dried yellow and hard, dried brown but not crunchy, dried brown and clammy. Chau Doc is one of the most popular shopping destinations. Knowing the heavy odor of fish sauce, the seller packaged very carefully so visitors do not need to worry about sanitation and smell! Travelers are easy to be enthralled by the Thai sweet tamarind sold everywhere. 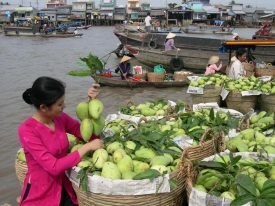 From time to time, you will also see stalls selling calameae, a typical fruit only in An Giang. Spiny orange calameaes are originated from Thailand and imported to An Giang across the Cambodian border. The thorns outside the fruit is small but not quite spiny. They smell like a jackfruit and a little incense of the forest. After peeling the cover, visitors will enjoy its sweet and sour taste. However, it is edible only for a few days. Therefore, you should choose to buy unripe fruit for gifts. To An Giang, do not forget the food made from jaggery. It is very soft, and slightly like coconut but much cooler. Visitors can buy pickled jaggery jar as a gift which can be used for several months. However, the best quality is still fresh jaggery. In addition, jaggery is also a famous specialty in Chau Doc, used to cook sweet soup, mix with lemon juice… Note that fresh jaggery is only used about 2 – 3 day when stored in the refrigerator. It is available at the market but should be used within 24 hours, preferably using immediately. Canarium is named after the way of processing. Fresh canarium is crushed, squeezed, and rubbed to remove all the acrid, finally pickled for several hours before used. This food must be treated so carefully to prevent canarium from being crushed, and to keep the green color after rubbing. Canarium can be eaten with chili salt, which is sweet, crunchy, and delicious. 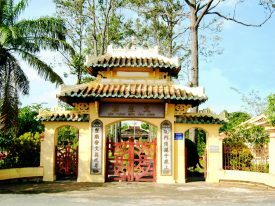 Do not forget to travel with the Daily Travel Vietnam in Mekong Delta 3 days tour (My Tho – Ben Tre – Can Tho – Cai Rang – Chau Doc) to have interesting trips and select attractive gifts for relatives.